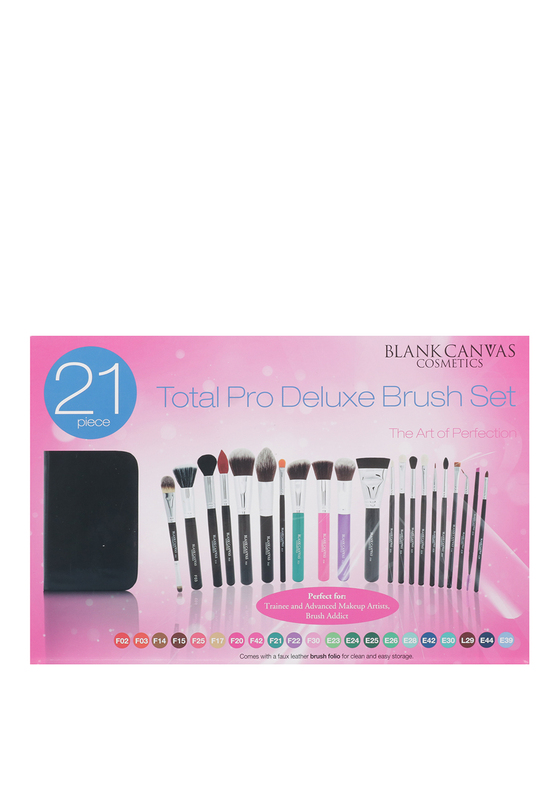 The wonderful Total Pro Deluxe Brush set from Blank Canvas is fantastic for makeup fanatics, make up addicts and even exert make up artists. 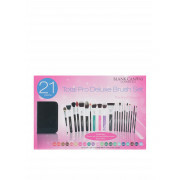 This amazing gift set contains 21 face and eye brushes, perfect for all forms of makeup applications and trends. Contains: F02 Double Ended Painter Style Foundation brush, F03 Medium Stipple Brush, F14 Small Contour Cheek Brush, F15 Small Tapered Red Bristles, F25 Large Powder/ Bronzer Brush, F17 Pointed Tip Concealer Brush, F20 Hot Pink Flat Brush, F42 Large Contour Brush, F21 Angled Contour Face Brush, F22 Round Top Face Brush, F30 Sculpt Brush, E23 Short Pencil, E24 Flat shader Brush, E25 Round Top Blending Brush, E26 Blending Brush, E28 Ultra Fine Liner Brush, E42 Pointed Crease Blender, E30 Brow Brush, L29 Lip Brush, E44 Flat Brush, E39 Bent Line Brush.